Adrianna Zsido and Mick Johnston catch fish at the derby. 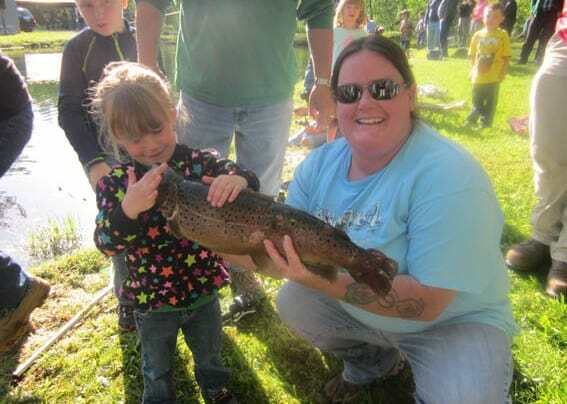 MENDON — The Annual Fran Renner Youth fishing Derby was held on June 3 at the Mendon Fish & Game Club in Pittsford, Vt. The pond was stocked with 200 trout ranging from 12-24 inches, plus seven large fish between 24-32 inches. However, only one of those fish were caught that evening. The next day some of the members and guests brought their children up and they caught them all. Registration was between 4-5 p.m., and the fishing commenced at 6 p.m.
Prizes were award for the first girl and boy to catch a fish. Other categories included longest and shortest fish. Following the derby all the junior anglers and parents, and friends went down the clubhouse for a free dinner. Fishing Derby Chairman and DJ Craig Robideau of C&C Music show awarded the various prizes donated by club members and other benefactors. Every junior angler walked away with a prize whether they caught a fish or not.